Smart Metric is ushering in the future of banking with a recent announcement. Issued out of Buenos Aires from company president and CEO C. Hendrick, the company unveiled its latest innovation. Hendrick’s claim that the next generation of EMV credit and bank cards are capable of containing the technology necessary to make them Biometric Fingerprint activated Cards is based upon advancements made by his company in integrating a fingerprint scanner inside a SmartCard. The technological platform that would result of such a unification between scanner and card could then be combined with a global-standard standard EMV (Europay, MasterCard and VISA) application that would allow for the highest-ever security on credit and debit ATM cards. According to the information provided in a press release on Marketwatch, the EMV Co. website published that at the end of last year, there were well over 1.24 billion chip-based payment cards in circulation around the globe that were EMV compliant. Additionally, the close of 2010 saw more than 15.4 million EMV terminals available for SmartCard-carrying consumers to use in stores worldwide. A SmartCard has the same shape a feel of a standard credit card, and can be designated by a chip that in mounted on its surface. This chip contains the card’s information and can be scanned by a reader that is EMV compliant. 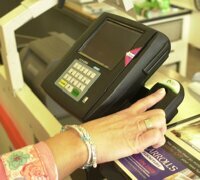 This, along with a PIN number that is typed in by the cardholder, enables the card to be used for a purchase. Such cards are often referred to throughout the banking industry as “chip and PIN” credit or bank cards. The technological developments made by Smart Metric will finally do away with the “PIN” number portion of SmartCard transactions which is, in fact, the least secure aspect of EMV cards. The “PIN” component of card transactions will be replaced with the Biometrics finger scan, which is much more secure. After long being a European standard, EMV cards are now being implemented in the United States. Already available to those Americans going abroad for business, “chip and PIN” cards should soon be attainable by leisure travelers as well so they can carry a card out of the country that will be seamlessly compatible at all European points-of-sale. The “traditional” American credit card with the magnetic swipe strip on the back occasionally does not work in other countries, especially at self-service kiosks that can be found at many bus and train stations. The “Banking Industry Fingerprint Activated Card technology” is scheduled to launch in the first quarter of 2012, after Smart Metric finishes constructing a facility in Latin America intended for the mass production manufacturing of these new cards.